This is the final of three posts dedicated to the Joan Crawford Blogathon being hosted by Crystal over at In The Good Old Days of Classic Hollywood. Tnx for letting me take part Crystal! Brief Synopsis – Two famous acting sisters living together in their old age still harbor ill will towards one another after years of a fierce rivalry. My Take on it – When I heard that Crystal was doing a Blogathon dedicated to Joan Crawford, I wasn’t really sure which movies to choose to review since as far as I could recall, I’d never seen any of her films and also had no clue as to which would be good and which would be a waste of time, so I just went with my gut based mostly on titles that hadn’t been chosen yet. My final choice for a film for this Blogathon was one which I have heard a lot about over the years, but never had a chance to see it myself. 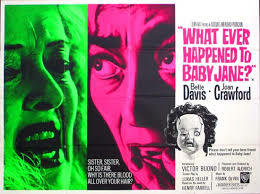 Being that I’m not much of an expert of Bette David and Joan Crawford movies (or their off screen rivalry), I went into this now knowing too much about what was going to happen. Both of these women give excellent performances here as the two grown up child actresses with lot (and lots) of baggage. It’s safe to even say that their perofmrnaces were both quite eerie because of the way everything is portrayed. I liked how we were gven a bot of background on the hostory of the sister’s rivalry from their days as children, through adulthood and then finally old age. This helps give us a larger perspective as to whom we are dealing with. We also don’t know which of the sisters should be trusted in what they say and do because of this known rivalry where each tries to outdo the other while at the same time try to control their own life. The dialogue is quite crisp and we are shown some great threads to this whole story that take us places we never expected. The thing I liked the most about this is the fact that we get a movie that is 54 years old that deals with the subject of how child actors end up. It’s a known fact that many child actors from the 70’s and 80’s had lots of problems later in life and it is a common phenomena of the time and of that specific population, but the think that perhaps this is a phenomena that has been true for decades upon decades is somewhat of a revelation. This movie proves that it has been an issue that people have known about and dealt with for a long time and it’s both scary and refreshing knowing that there really isn’t ever anything “new under the sun”. I’m glad I finally saw this film. Bottom Line – Davis and Crawford are both eerily superb here as the grown up actresses with lots of baggage. The devious plans of both of them are interesting to watch unfold and we never know who can really be trusted more between the two of them. Says so much about the lives of child actors despite not understanding the issues as well as we do today. Recommended! Pingback: THE JOAN CRAWFORD BLOGATHON HAS NOW ARRIVED – In The Good Old Days Of Classic Hollywood.